My now late grandmother used to read the obituary section of the newspaper each day to see if anyone she knew was listed. She said she had reached a stage in life in which a close friend dying had become as natural as the sunrise. That's how I feel when I log on to the Internet each day, when I am sadly these days met with news that my childhood icons like David Bowie, Maurice White and Prince, people who provided the soundtrack of my life and defined a generation, have passed away. It's devastating, unreal, and yet so poignant. Because of the prevalence of it in our daily lives, and the comfort of mass commentary on social media platforms, death is no longer so morbid to discuss. In fact, it provides an outlet for the person's humanity, and allows for those most affected by their passing to retain an element of their presence with them eternally. This last point is a recurring theme in HBO's family funeral home drama, Six Feet Under, whose brilliant series finale aired nearly 15 years ago. I had the pleasure of re-watching its concluding episode again recently at the Tribeca Film Festival, with a special scene-by-scene commentary by none other than show creator, writer and director, Alan Ball. Arguably the best TV finale of all time, the tenderness, presentation, trajectory of the characters and the utterly gut-wrenching screenplay remains unprecedented. And it's now more relevant than ever before. 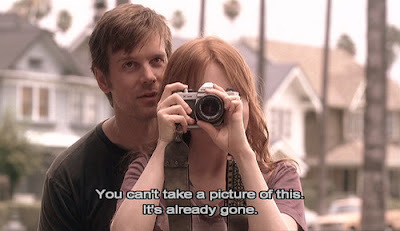 In retrospect, Six Feet Under was far ahead of its time. Not only does it speak eloquently about death, it creates an urgency for life. Each character is symbolic of his or her own desperation to be better, to push forward, and to ultimately be free--no matter how difficult and unrealistic that may seem to be. Sure, the characters are mess. They're often standing in their own way. But they're trying. And that's the beauty of the screenplay and each character--their struggles. But not only are their journeys important to the storyline. It's the ghosts, or rather how the characters conjure their departed loved ones in a way that provides them with a sense of support, a cure for their solitude, kick in the pants, and an unexpected confrontation. No matter the circumstance, death continues to impact their lives. Not in a haunting way, but in a familial sense. And it's completely innate. Because that's how death impacts us. At even its most crippling, it brings us together, drives us toward reflection, and most of all motivates us to think inwardly about ourselves and our own lives. If you've never seen Six Feet Under, it is absolutely mandatory viewing. Trust me, you'll thank me later. For those who have watched the series, share what you love most about it in the comments section. This series was top notch--inventive, provocative, funny, heartbreaking. I didn't miss a single episode. This is one of the HBO series I keep meaning to binge (along with Oz and Deadwood) I see universal praise for it. Loved this show. For the way it brought subtle humor and made this deeply relatable characters. I think you said it all. The characters were a mess, but they were trying. That finale capture the essence of each character and what we as viewers would have hoped for their futures perfectly! I love that ending even though I start bawling like a baby the moment Claire steps in that car. I love this--and I want more! Yes, Candice, write a chapter in your forthcoming book on film and television. Yes, I am conjuring it up. That's what I do. So. I had to watch the final 8:58 minutes of the final to cry before work.